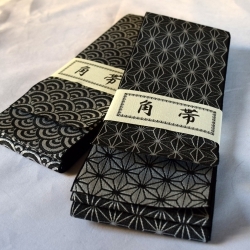 Kaku obi Awasé-Orizuru Obi Awase: double jacquard fabric obi Kiryu. 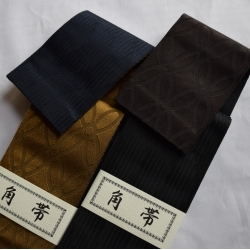 Black / Dark Blue 100% Polyester- 390 x 10cm -Quality: soft, solid. 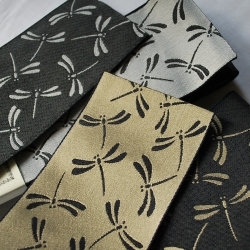 Kakuobi dragonfly (Obi for Iaito,Kimono of men) 100% polyester 390 x 10cm Single layer with double face (reversible) Dragonfly is a symbol of victory. 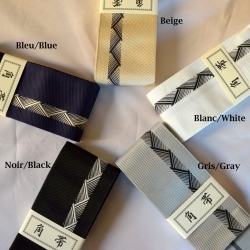 Kakuobi (Obi for Iaito,Kimono of men) 100% polyester 390 x 10cm Black Traditional Japanese belt to be worn with a kimono, yukata, or when practicing martial arts.